Never a disappointment to science fiction fans, I have found that Crichton's novels are always the quality readers want to read and writers want to achieve. His 'Jurassic Park' trilogy not only thrilled millions of readers worldwide, they successfully terrified movie-goers. John Hammond, an elderly billionaire with a passion for dinosaurs, has purchased his own island off the coast of Coast Rica, hired the top scientists in engineering, genetics, mathematics, and various other fields, and had dinosaurs grown from bits of preserved DNA, all for the sake of the greatest zoological attraction for children in the world. When problems begin occurring on the super-secret island attraction-in-progress known as "Jurassic Park", it's a true battle of man versus nature as the occupants of this secluded island come face-to-face with their own prehistoric creations- monsters that were never meant to coexist with humankind. Paleontologist Dr. Alan Grant is summoned from his most recent dig to tour the island, along with his assistant Dr. Ellie Sattler, in the hopes of recruiting Grant to back the island's creation and join Hammond's team. Hammond even shows his confidence in his prehistoric replica that he also includes his own two young grandchildren in the first-ever guided tour of the park. It takes very little time for the flaws of this plan to become evident, leaving everyone at the mercy of animals they know very little about. Fighting for control, as well as survival, the island's occupants experience the horror of creature who it seems are probably extinct for a reason. Much more than merely a thrilling work of fiction, this novel carries a greater message to the reader, a warning of the dangers of advancing technology for the sake of glory and riches, without consideration for whether their advancements should take place just because they can, and without fully understanding the technology they're dealing with. Jurassic Park addresses specifically the on-going debate surrounding the ethical use of DNA engineering, and serves as a global warning of its potentially disastrous effects. This is mostly done through the rantings of one Dr. Ian Malcolm, a mathematician enlisted to help make Jurassic Park functional, though he doesn't share the views of John Hammond. 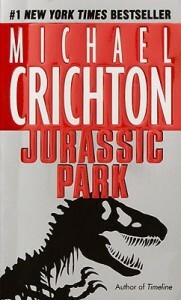 Through Malcolm, Crichton delivers several deep, philosophical tirades about man trying to control nature without realizing that nature cannot be controlled, and even long after man has destroyed themselves, and maybe even all current life on the planet, the ancient earth will survive, and eventually life will spring up again, adapted to whatever changes have occurred to the planet. It will be like man never existed. This lesson is delivered so passionately by the character that no reader can ignore or deny the truth in his words. A fascinating read with a strong message, Jurassic Park is the perfect read for all sci-fi fans. The wide variety of characters' backgrounds and personalities, the heart-pounding scenes, and exquisitely descriptive language bring the existence of Jurassic Park to life for the reader in a way I have never before experienced in this genre.